I have made Kimchi once before and it worked. My man loves it, I think it harks back to European roots and eating Sauerkraut. 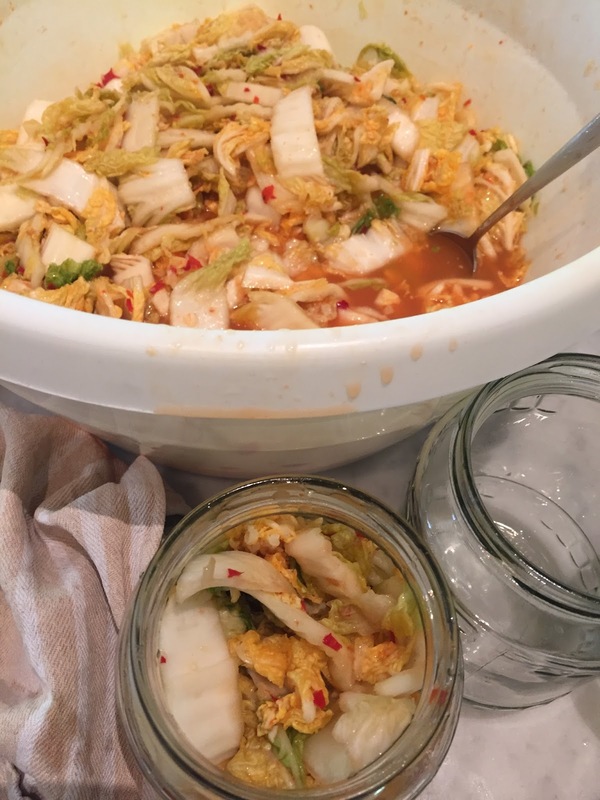 To make the Kimchi magic happen in my kitchen I have used Sarah Wilson’s Simplicious as a starting point. But to say I followed it would be an exaggeration, I got the general vibe of the method and pressed go! 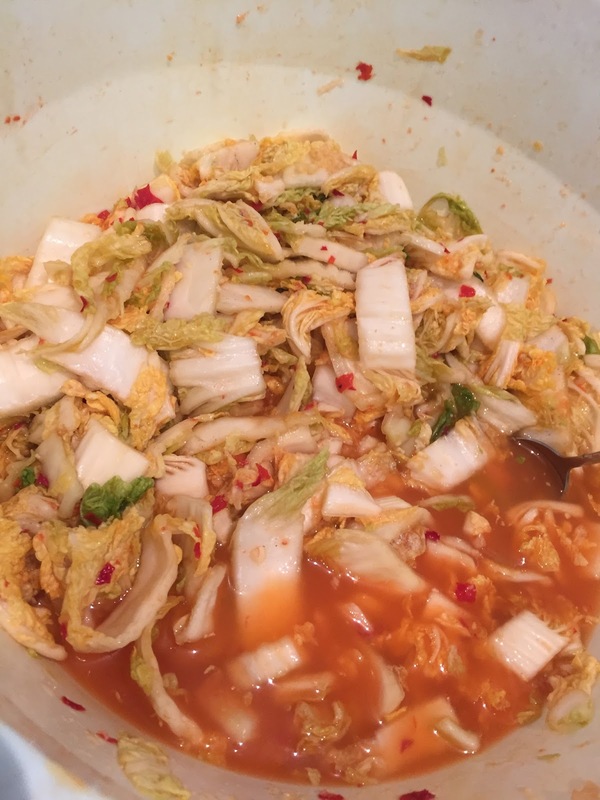 Kimchi is a traditional Korean dish of fermented vegetables. Most recipes usually contain cabbage, and occasionally onions, garlic and red capsicum. Fermentation occurs with water and spices added to the veggies, with the lactic-acid bacteria that is created renowned for increasing good gut bacteria. 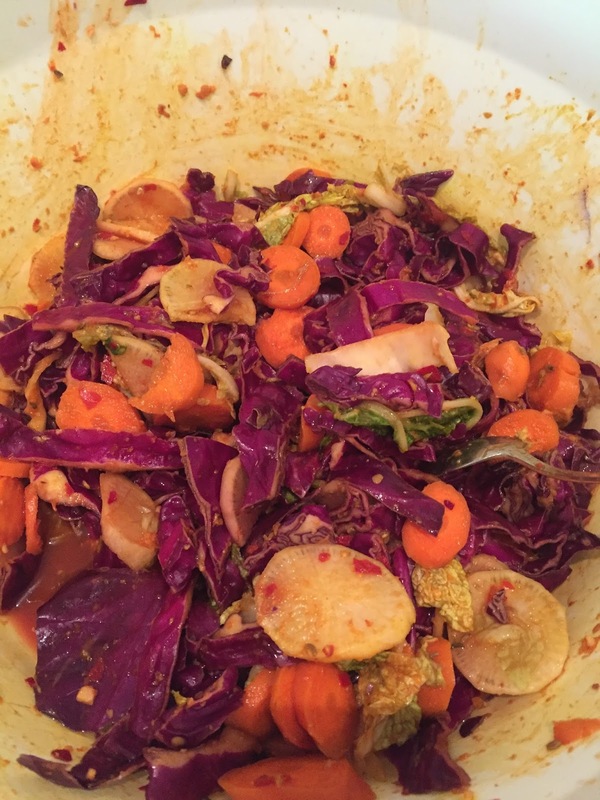 I made a wombok based Kimchi and a mixed vegetable fermented vegetable mix. The basis of the fermented Kimichi is washed and sliced vegetables, a good dollop of sliced/processed chilli, ginger and garlic, a few large tablespoons of salt and some good fish sauce.All this goodness is massaged into the vegetables (I sue rubber gloves ). There is a strong smell lingering about your large container. I pinched my bread making containers for the job, but I would recommend using a ceramic or glass bowl. This is slow food as the process of fermentation is magic that takes time. After leaving the mixture overnight it has ‘wilted’ as the salt has drained the moisture out and you are left with well marinated goodness to scoop into sterilized jars. It is important that the jars are not tightly closed as there is a lot of gassing and fizzing going on at this stage. I keep my jars next to the stove and after 2-3 days they are ready to seal and eat.